Mow before 10 AM, but never when it’s windy or excessively dry. 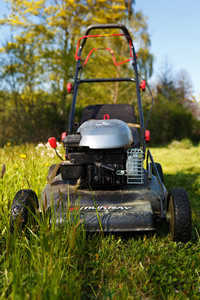 Lawn mowers are designed to mow lawns, not weeds or dry grass. Metal blades can create sparks when they strike rocks, creating a fire risk. Use caution. In wildland areas, spark arresters are required on all portable gasoline-powered equipment. This includes tractors, harvesters, chainsaws, weed eaters and mowers. Keep the exhaust systems, spark arresters, and mowers in proper working order and free of carbon buildup. In wildland areas, grinding and welding operations require a permit and 10’ of clearance. Keep a shovel and a fire extinguisher ready to use. Don’t drive your vehicle onto dry grass or brush. Hot exhaust pipes and mufflers can start fires that you won’t even see - until it’s too late!